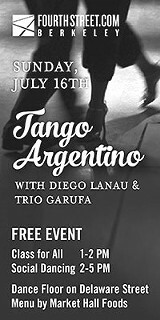 Join us for an afternoon of tango! We have invited famed instructor Diego Lanau from Buenos Aires to treat us to a free dance class and then Trio Garufa will play for us until 5pm for open social dancing! • Market Hall Foods ~ Fourth Street, will offer a special menu. Come with family and friends... happy summer!